Teaming up with Candis, Elia B is offering one lucky winner a chance to snap up £300 worth of online vouchers to be redeemed on the online store. Elia B was originally formed in 2010 as ‘Just Ballerinas’ specialising in a bespoke selection of ballerina inspired flats. The company was then re-branded in 2013 as Elia B, London with the intention to keep growing the brand into something even more beautiful. 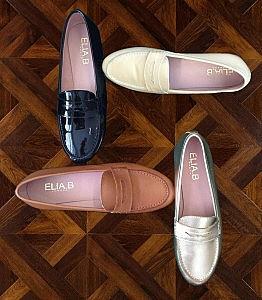 The Elia B collection offers a stunning selection of timeless classics, ranging from ‘Bananas’; the brands iconic flat, featuring the signature hidden in-built wedge, to ‘Rome’; the best-selling tassel loafer. The vast array of products now includes a selection of pumps, brogues, loafers, boots, flats and even slippers. Get ready for the Winter and browse through the stylish selection of AW14 boots or if you’re feeling really generous, use the voucher to shop for a friend or a loved one ready for Christmas. Don’t just get fit, get military fit! My great niece loves wearing flats as she is 6ft, I would love to win these vouchers for her. I would love to win this as my daughter is very tall. She finds it difficult to find lovely flats. Love these shoes flats are all I can wear and my daughter would love these too…. They sound fabulous! Fancy some new boots. If I win any of my chosen items I shall be overjoyed!